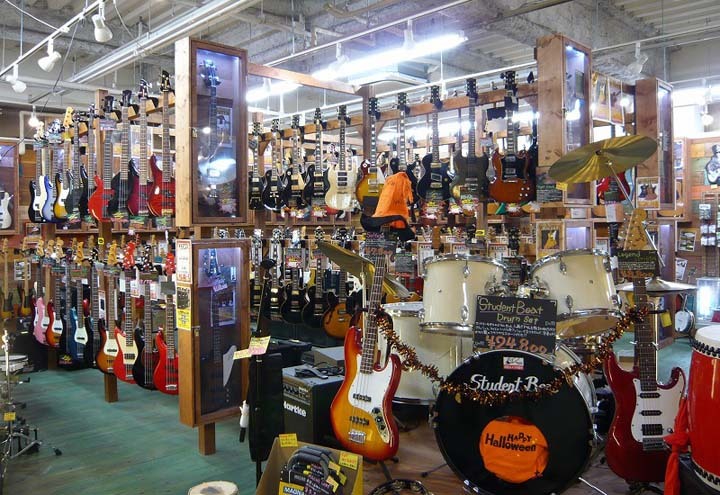 Manga Shoko has a very large selection of pre-owned musical instruments. Manga Souko is a recycle shop chain that boasts one of the largest inventories of recycled entertainment items available at any recycle store on Okinawa. They sell and buy comics, books, CDs, DVDs, games, Nintendo DSs and Wiis, PlayStations, toys, figurines, cards, electric home appliances, sports gear, fishing tackle, musical instruments, secondhand clothes, accessories, brand-name goods and almost anything else people use ion their everyday lives. 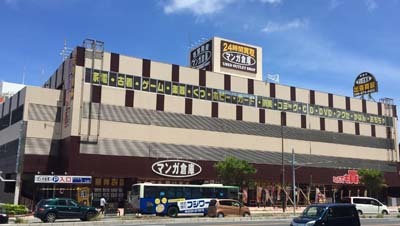 Manga Shoko Main Store is on Hwy 58 in Gusukuma, Urasoe. 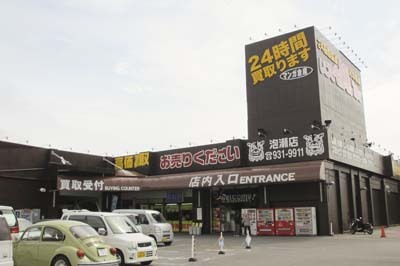 The main store of Manga Souko is it’s Urasoe branch on Hwy 58 near Camp Kinser Gate 3. Manager Tetsutaro Kimura is enthusiastic about his shop. “You can find real treasures in this store! We have here many fantastic items, that are sure to make your eyes sparkle with delight,” he says. Kimura says, Manga Souko would you like people enjoy shopping and find Made-in-Japan products at very reasonable prices. “And we are always waiting for people who sell American products, such as clothes, music instruments, vintage goods, and so on, and we always pay in cash,” he reminds. He says he would like to see Manga Souko to become the best place for both of Japanese and foreigners to exchange things with each other. Manga Shoko Awase Branch is next to Okinawa Comprehensive Sports Park. As the concept and philosophy of Manga Souko, Kimura explains, “Nowadays, people easily throw away many products with no hesitation. At the same time, we are living in an age when not only natural resources and environment but even many cultures and their values are under threat. “Manga Souko aims to make effective use of resources through our initiative and efforts for ‘entertainment recycling,’ so that we can help promote and protect of precious traditional culture and heritage, and pass them on to future generations. “Through trading with customers, we think a great deal of the fact that we can mutually communicate the heart and philosophy of treasuring culture and goods that people create. “All of us continue to put our effort to extend and spread such ideas. We would be grateful, if you could share the pleasure of your books, DVDs, CDs, games, sundries, and clothes, which you have used and enjoyed in the past, with people of the present age,” Kimura concluded. Manga Souko Urasoe Branch is located at 2689, Gusukuma, Urasoe city, Okinawa. Tel: 098-874-4455. The Awase Branch is located at 3-13-1, Yogi, Okinawa city, Okinawa. Tel: 098-931-9911. Both shops are open 24 hours a day, every day of the year.